Roulette is a game, that has turned into a symbol of the gambling industry. There is hardly any movie, which represents a stage in a casino without the emblematic roulette wheel. Entering the casino, the most boisterous table has always been the roulette table. Even though the game itself is as old as the hills, it is still appealing to the players due to its adrenaline-based nature. Casinos offer hundreds of different games. Thus, it is hard for both versed and inexperienced players to pick up the right game. That, in fact, is an essential step of your playing session. Every player needs to find the game, which best fits their bankroll and abilities. However, there is one game, which simply cannot go wrong and that is roulette. Roulette has touched the hearts of many players with its simplicity and flexibility. Of course, there are many reasons why namely roulette has become the definite symbol of the gambling industry. Many people consider it as an old-dated game, but the truth is that that it is an old, but a gold game! Being invented in the 18th century, the game has gone a long way through the world. Nowadays, it has evolved in three main variations – American, French and European. The thrive of roulette is based namely on that diversity, which the game offers. Whenever you get bored, it is always good to try a different variation of your favorite game. Besides the three main variations of the game, it offers also some innovative and exciting versions like Roulette Royal and Mini Roulette, available in almost every reputable online casino. It should be mentioned that even though the game is played by very similar rules, it has some differences in terms of rules, betting options and payouts. Thus, every player should firstly meet the specific rules, that govern the particular table. The charm of roulette is that it is impossible to get bored by it. Talking about the versatility of the game, it is impossible to overlook the fact that it provides great betting options. Bets can be placed on a particular number, group of numbers or a category. Of course, some of the bets are safer than others, which decreases the payout. For example, if you place a bet on all the red numbers, you cover 18 numbers (or almost half of the betting layout, because of the presence of the zero pockets). This will not earn you a life-changing fortune, but it is quite easy for the “fresh” players. On the other hand, if you place a bet only on one number, you have only one option to win opposed to 36 (or 37 for the American variation) to lose. But if you are lucky enough to score a bull’s eye, your payout will be way higher. If you are willing to increase your chances to win, you can place multiple bets on one spin. The only thing, which you need to bear in mind is that you need to comply with the limits of the table. In a nutshell, the riskier the bet is, the higher it pays off. There are also a number of betting strategies, which can keep your playing style under control. These are easily applied to the game, but you need to go for the most proper one. Based on the individual preferences and personal bankroll, every player needs to find out the best betting strategy. There are two main types of betting strategies – positive and negative progression systems. With the positive progression methods, the player increases the stake after every win and decreases it after every loss. The negative progression method is just the other way around – after every win, the player decreases the stakes and after every loss – the bet is increased. The logic behind it is to get back all of your lost money in a single “lucky strike”. People always refer to roulette as a game of luck. It is absolutely reasonable to allege this, because no strategy can control the ball on its way to the “lucky” pocket. Even though it is impossible to calculate where exactly the ball will settle on, there are certain strategies, which can save you a lot of troubles. 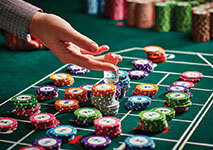 Usually, roulette strategies are the easiest ones, which are a real piece of cake in comparison to other casino games. The idea is to manage your bankroll properly, so that at last you will have enough funds, even if a bad run occurs. For that purpose, you need to set yourself a special bankroll only for your playing sessions in the casino. Do not use the money, which you cannot afford to lose. Never count on the idea that entering the casino will make you rich. The key is to enjoy the game, but not to addict to it. In an attempt to recoup what you have lost, you may lose control over the situation. To win, you must first learn how to lose! If your pockets are not lined with gold, better stay disciplined and stop playing, when it is time. Being a simple game at its core, roulette gives a great experience to its fans. The heart beat is going crazy in anticipation to see where the small marble ball will land on. The concept of the game is easy to be grasped. In European roulette, there are 37 numbered pockets, and in American roulette, there are 38 pockets. A dealer tosses a ball in a direction, opposite to that of the wheel. The aim of the player is to predict as accurate as possible which will be the “lucky” number, chosen by the ball. Like many other casino games, roulette definitely favors the house. The so-called house edge represents the advantage of the casino over the player’s game. As we already mentioned, American roulette offers an additional double-zero pocket, whereas French roulette only involves one zero pocket. This additional pocket actually makes a significant difference when calculating odds. The American roulette table offers 5.26%, while the French and European are reduced to 2.7%. Under certain conditions, the house edge may go even lower to 1.35%. That is why, it is a wide-spread concept that the European and French roulette tables are way more advantageous to the player than the American one. Online gambling is unquestionably a booming industry. 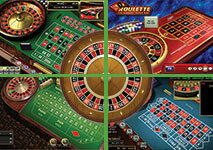 The most valuable aspect of roulette is that it is a flexible and diverse game. Moreover, it provides even the most experienced player with a flow of excitement, that cannot be rivaled by any other game. Even though the game is old enough, it cannot be said that it is old-fashioned, even the opposite. It has become the backbone of every gambling institution, attracting the attention of many people every day. Unlike many casino games, roulette offers betting flexibility and the opportunity to bet directly against the casino.